West Windsor, N.J. – Calling local artists! 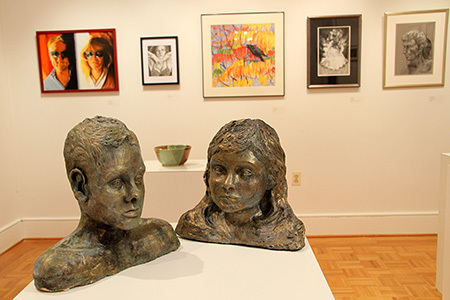 Artists aged 18 or older who live, work, or attend school in Mercer County are invited to submit their art for consideration for this year’s “Mercer County Artists 2016” exhibition at The Gallery at Mercer County Community College (MCCC). Jurying takes place on Saturday, Feb. 13, 9:30 a.m. to 5 p.m., at the Gallery. The MCCC Gallery is located on the college’s West Windsor campus, 1200 Old Trenton Road. Directions and a campus map can be found here. Artists may enter up to two original works completed in the past two years (since February, 2014) in any media except photography. (The county hosts a separate photography exhibit). They are asked to drop off their work between 9:30 a.m. and noon. Early drop-off is Thursday, Feb. 11, noon to 3 p.m. Works that are not accepted for the show should be picked up between 3:30 and 5:30 p.m.
Last year's "Mercer County Artists" featured works by 63 artists. Prizes totaling $1,500 will be awarded, including the Utrecht Art Supplies Best in Show Prize and the annual West Windsor Arts Council Prize for outstanding work by a West Windsor artist. Mercer County Cultural and Heritage Commission Purchase Award winners will become part of the County’s permanent art collection. The juror for the exhibit is Jesse Vincent, Education Coordinator at Artworks Trenton, where she coordinates and develops all adult and youth education programming, as well as instructs artistic enrichment workshops for Artworks Print Studio. Vincent also serves as Assistant Curator for Sales Gaspillée, one of Philadelphia's First Friday art shows. A full prospectus for the exhibit is available at www.mccc.edu/gallery. For a hard copy of the prospectus, artists should email their name and full mailing address to gallery@mccc.edu. The “Mercer County Artists” show will be on display from Monday, Feb. 22 through Thursday, March 24. An Opening Reception and Awards Ceremony will be held Wednesday, Feb. 24 from 5 to 7:30 p.m. The show is free and open to the public. The exhibition is co-sponsored and supported by the county’s Cultural and Heritage Commission through a grant from the Mercer County Cultural and Heritage Commission, with funding from the New Jersey State Council of the Arts/Department of State, a partner of the National Endowment for the Arts.